There isn't going to be a meeting of the Plymouth County neighborhood convention of the churches next month because of cranberries. That sounds rather strange, but Gen. Sec. A. H. Wardle of the [Middleborough] Y. M. C. A., who is secretary of the convention, announces that to be the reason for missing the September meeting. But it didn't happen. The active members of these churches are so busy gathering up cranberries, which literally translated means money, that they can't stop to entertain church delegates, Mr. Wardle states, so the meeting will go over till October. It is said to be the first time the convention failed to resume its meetings in September, and the reason assigned is considered a very unusual one. 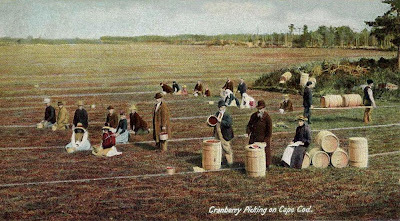 Cranberry pickers at Middleborough (like those depicted on this postcard of nearby Cape Cod) were in high demand each September and October, so much so that in 1912, the Plymouth County Neighborhood Convention had to be postponed until the close of the harvest season. Here, the pickers are seen working in staked rows, the typical manner for hand-picking. Brockton Times, "Cranberry is King", August 24, 1912.